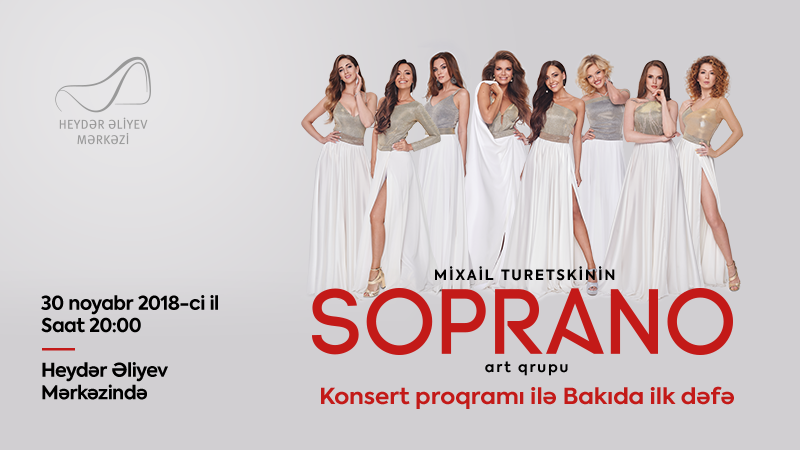 The SOPRANO Group’s Concert in Heydar Aliyev Center buy tickets online. Delivery of tickets for the event The SOPRANO Group’s Concert. On November 30, the Heydar Aliyev Center is to host the concert by the SOPRANO art group led by the People’s Artist of Russia Mikhail Turetsky. The vocal group will present a very versatile and enjoyable repertoire to the Baku audience. The SOPRANO is a unique vocal endeavor by M.Turetsky comprising a full spectrum of existing women’s voices ranging from coloratura soprano the highest to mezzo the lowest.